The Technology Strategy Board funding follows the support given earlier this month to AWS Ocean Energy by the Scottish Government’s WATERS programme (Wave and Tidal Energy: Research, Development and Demonstration Support). Funding will further develop AWS Ocean Energy’s AWS-III, a ring-shaped multi-cell surface-floating wave power system. The funding from the Technology Strategy Board is part of a £7m million funding package awarded to 9 wave and tidal stream research and development projects. Simon Grey, Chief Executive of AWS Ocean Energy, says: “This latest funding is very welcome as we continue to develop our AWS-III wave energy device. A single utility-scale AWS-III, measuring around 60 m in diameter, will be capable of generating up to 2.5 MW of continuous power. AWS Ocean Energy says it is seeking industrial and utility partners to enable the launching of a 12-cell, 2.5 MW pre-commercial demonstrator in 2012 and subsequent commercialisation of the technology. Kenneth Hogan of FERC wrote that GreenWave Energy Solutions had failed to file both a required notice of intent and a pre-application document (PAD), in a letter sent Monday. Both documents were due in early May for GreenWave’s two proposed wave energy farms off San Luis Obispo and Mendocino. Both documents are intended to determine the scale of the projects now being considered and the “probable revocation” applies to both projects. Earlier this year, GreenWave announced they had entered into an agreement with Ocean Power Technologies (OPT) of New Jersey, one of the world’s top companies in the field to get the two projects going. GreenWave has so far pushed the biggest wave energy project idea of all, one that would generate a whopping 100 megawatts of power off Mendocino. GreenWave was granted a preliminary permit in May 2009, after FERC had sent the permit back for more details and deliberated for nearly a year. A preliminary permit is an exclusive right to study an area of the ocean. At the end of a successful preliminary permit process, that developer gets first right to install wave energy devices, by virtue of being the first to file for the preliminary permit. The area now claimed by GreenWave had previously been claimed by Chevron. But GreenWave is now told they will probably lose their claim to that area. The cancellation would be bad news for Tony Strickland, a Southern California Republican who made his work as one of the four GreenWave Partners a key plank in the campaign with which won his state Senate seat by the narrowest of margins two years ago. He lists “alternative energy executive” as his occupation. Now, Strickland is using his status as a green energy businessman in his campaign to be state controller. He won the Republican nomination last month by a wide margin. “Tony serves as Vice President of GreenWave Energy Solutions LLC, a company that seeks to harness the power of ocean waves to provide energy to Californians,” his campaign website states. GreenWave has never held a single local meeting to introduce or explain its claim of the waters off Mendocino village. Some locals are amazed at how much Strickland makes of a project that exists only on paper. “GreenWave Energy Solutions was the recipient of the United Chamber of Commerce Small Business Award for 2008 and Tony has been featured on CNBC for his work with the company,” the Controller 2010 campaign website states. On the other hand, the permit termination would be good news for the Marine Life Protection Act Initiative. According to a California Attorney General opinion, the MLPAI is banned from putting any new marine parks (of any of the three kinds) in areas where there are pre-existing ocean leases, which includes the GreenWave lease off Mendocino and the PG&E lease off Eureka. Thus, a big area of ocean real estate is currently off limits to creation of new protected areas by the MLPAI. Earlier this year, GreenWave promised FERC several rounds of local meetings for March and April, which failed to materialize. And the company has filed other documents late during its FERC process. But FERC’s revocation threats may be premature. A review of the FERC lease documents shows GreenWave may have a valid reason why they didn’t file the documents that resulted in this week’s letter from Hogan. The FERC lease gives GreenWave the option of filing a Notice of Intent and Draft License in two years, instead of the one-year filing requirement for the NOI and PAD. However, to further complicate matters, GreenWave actually promised the NOI and PAD would be done in June 2010. That promise was made in GreenWave’s 45-day filing in June 2009. GreenWave Energy Solutions is described as a limited liability company with five members, President Wayne Burkamp, Strickland, engineer Bill Bustamante and prominent Southern California housing developers Dean Kunicki and Gary Gorian. Attempts to reach GreenWave president Burkamp or FERC’s Hogan weren’t successful by press time. A renewable energy company has gone “back to the future” to develop a device to harness power from waves. AWS Ocean Energy chief executive Simon Grey said its prototype AWS-III on Loch Ness had evolved from “forgotten” technology first seen in 1985. He said the device could eventually be used in the Northern Isles. The technology was also tested on Loch Ness in the 1980s, but the Conservative government of the time suspended the wave energy programme. Highlands Liberal Democrat MP and chief secretary to the Treasury, Danny Alexander, has visited the test site. He said the progress being made by the company was impressive. Mr Grey said Inverness-based AWS Ocean Energy was exploring the idea of a machine which had rubber rather than steel components. Further research led to staff uncovering the similar concept from the 1980s. He said: “We discovered that the work done in 1985 was rated as the most promising by the Department of Energy at the time. Mr Grey said the wave energy programme in the 1980s was fully funded by the UK government but the work was later suspended. The chief executive said AWS-III was a re-working of a concept people had “forgotten about”. 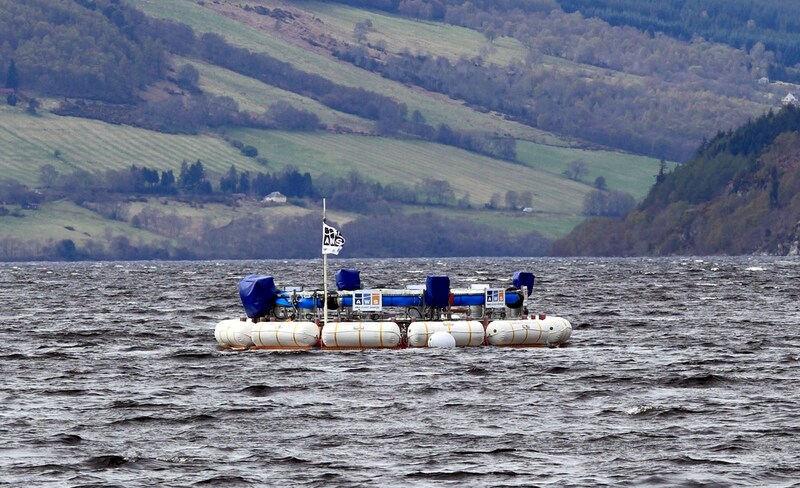 The ring-shaped machine on Loch Ness is one tenth of the size of the device that could eventually be generating electricity on a commercial scale. Full-scale machines could be deployed in the sea around Orkney and Shetland following further tests in 2012. Investment of £2.3m was secured from the Scottish government to develop the AWS-III. In 2008, AWS Ocean Energy said it had set its sights on winning the world’s largest prize for marine energy innovation. It said it planned to double its workforce in 12 months, in part to improve its chances of securing the Scottish government’s Saltire Prize. The last thing that supporters of a promising renewable energy source want is a technology that harms wildlife. 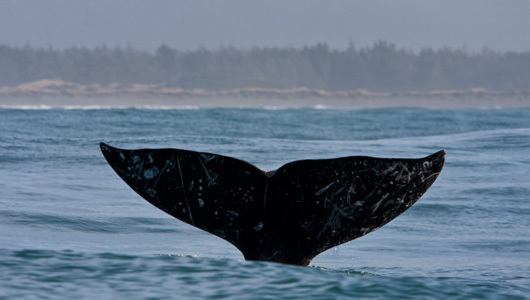 So before wave energy buoys are deployed off the Oregon coast, scientists and developers want to make sure that 18,000 migrating gray whales are not put in jeopardy. These whales, weighing 30 to 40 tons each, make a twice-yearly journey, heading south to breed off Baja, Mexico, in winter, and back up to the Pacific Northwest in spring. Biologist Bruce Mate wants to find out if a low power underwater noise can be used effectively to nudge the whales away from wave energy devices. “We want them to turn their headlights on,” says Mate, director of Oregon State’s Marine Mammal Institute. Mate says the “whoop-whoop-whoop” sound being tested “is designed to be something unnatural. We don’t want them to think of it as background noise, as a wave, or as another animal. We want it to be something that is disconcerting,” he says. Disconcerting enough so that the animals would move a few hundred yards away from the energy-capturing buoys, expected to weigh about 200 tons. 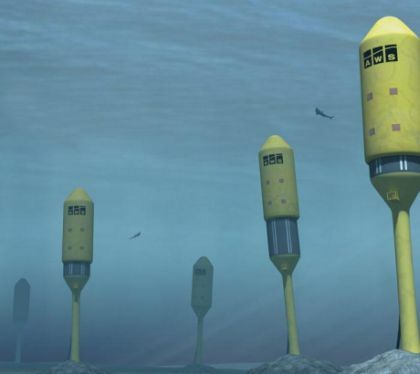 The underwater cables on these wave buoys are solid, 4 to 6 inches in diameter. Mate says a gray whale swimming 3 to 4 mph could be seriously hurt if it collided with a cable. Mate has a grant from the Department of Energy to test whether the acoustic device is the right strategy to keep whales and buoys away from each other. Tests will begin in late December, and end before mothers and calves migrate north in May. The noise-making device, about the size of a cantaloupe, will be located about 75 feet below the ocean surface, moored in about 140 feet of water. During the testing, it will make noise for three seconds a minute, six hours a day. Gray whales stick close to shore, about 2.5 to 3 miles away. Swimming farther out, they can become lunch for killer whales. During the tests, researchers will use theodolites, surveying instruments that measure horizontal and vertical angles. Mate says the animals’ actions should be fairly easy to observe as they encounter the noise. “These animals track very straight lines during migration. They are motivated to get to the other end,” he says. The Federal Energy Regulatory Commission (FERC) licenses wave energy technologies, and dozens of agencies oversee how this technology will affect ocean life. “Wave energy developers are required to undergo a rigorous permitting process to install both commercial-scale and pilot projects,” says Thomas Welch of the Department of Energy (DOE). Ocean Power Technologies is set to deploy the first of 10 energy-generating buoys off Reedsport, Ore., later this year. Wave energy developers say they have worked with conservation groups from the start, dealing with everything from whales to erosion. “As an untapped renewable resource there is tremendous potential,” says Justin Klure, a partner at Pacific Energy Ventures, a company that advances the ocean energy industry. A believer in clean energy, Klure says it is imperative that the technology be the least disruptive. “Nobody knows if a large buoy or any other technology is going to have an impact on an ecosystem. A misstep early could set back the industry. This is hard work, it’s expensive, if you don’t have a solid foundation, we feel, that is going to cost you later,” he says. Klure says the industry has studied how other energy development, including wind and solar, have dealt with environmental challenges. “I think the lesson here is how critical project siting is. It’s the same concept as land use planning for the ocean. Where are the most sensitive ecosystems? Where are areas that need to be preserved for recreation, or commercial fishing?” Klure says. It will likely be five to 10 years before wave energy provides significant electricity production. But the acoustics research by Mate could provide help to animals, reaching beyond the Pacific coast. “We certainly hope it has broader uses,” Mate says. If the sounds do move animals to safety, similar devices could be used to lure whales back from shallow waters if they are in danger of stranding — or even help whales or other marine mammals skirt the poisons of a large oil spill. Harnessing the ocean waves for emission-free power seems like a tidy concept, but the ocean is anything but tidy. Waves crash from multiple directions on a seemingly random basis, and converting the kinetic energy into electricity is a frontier of alternative energy research that requires grappling with large unknowns. But with several utility companies and states, and in one case, the U.S. Navy, investing in wave power, or hydrokinetic energy, may not be too far off in the utility mix. At least two companies hope to reach commercial deployments within the next three to five years. Off the coast of Orkney, Scotland, is the Oyster, a white- and yellow-flapped cylinder, 40 feet tall and firmly locked into the ocean’s bed. With a total of seven moving parts, two of which are pistons, it captures waves as they near the coast. Oyster funnels them into a pipe and carries the power inland to a hydroelectric power generator. The generator has been supplying the United Kingdom’s grid with 315 kilowatts of energy at peak power since October. A farm of up to 100 Oysters could yield 100 megawatts, according to Aquamarine Power, the Scottish company that developed the technology. “From an environmental perspective, in the sea you have a very simple machine that uses no oil, no chemicals, no electromagnetic radiation,” said Martin McAdam, CEO of Aquamarine. The Oyster provides a tiny fraction of the 250 gigawatts of power that the water is capable of providing, including conventional hydroelectric energy by 2030, according to the United Nations. At least 25 gigawatts of that will come from marine renewables, according to Pike Research, a clean technology market research group. The non-conservative estimate is as much as 200 gigawatts. And 2015 will be the benchmark year to determine which of these estimates will be true. The field of hydrokinetic power has a number of companies such as Aquamarine, all with unique designs and funded by utility companies, government grants and venture capitalists. If at least 50% of these projects come online by 2015, marine power could supply 2.7 gigawatts to the mix, according to Pike Research. A gigawatt is the electrical output of a large nuclear power plant. There are six marine renewable technologies currently under development that aim to take advantage of ocean waves, tides, rivers, ocean currents, differences in ocean temperatures with depth, and osmosis. The company has been testing its wave energy device, called the PowerBuoy, in the ocean since 2005. It recently launched another device a mile offshore from the island of Oahu in Hawaii and connected it to the power grid of the U.S. Marine Corps base. It now supplies 40 kilowatts of energy at peak, enough to power about 25 to 30 homes. “The Navy wants to reduce its reliance on imported fossil fuel; they have a strong need to establish greater energy independence,” said Dunleavy. The buoy captures the energy from right-sized waves (between 3 and 22 feet tall), which drive a hydraulic pump. The pump converts the motion into electricity in the ocean using a generator embedded into its base. A subsea cable transfers the power to the electrical grid. A buoy farm of 30 acres could yield 10 megawatts of energy, enough to supply 8,000 homes, said Dunleavy. The structures rise 30 feet above water, and extend 115 feet down. They would not be a problem for commercial trawlers, which are farther offshore, or for ship navigation lanes, said Dunleavy. Recreational boaters, however, may have to watch out. In comparison with a system such as the Oyster that brings water ashore to power turbines, creating electricity in the ocean is more efficient, said Dunleavy. “You lose a lot of energy to friction,” he said. But Aquamarine’s system of having onshore power generation will cut down on maintenance costs, according to McAdam. Operation costs are expected to consume as much as 40% of the budget of operating a marine power plant, according to Pike Research. Ocean Power is already selling its device for individual commercial use and building larger units of 150 kilowatts off the West Coast of the United States and for the utility company Iberdrola’s unit in Spain. It is also developing the first wave power station under the Department of Energy’s stimulus program at Reedsport, Ore., according to Dunleavy. The farm, which currently has a 150-kilowatt unit, could grow by nine additional buoys. And as for price, which is a major concern, Dunleavy said that cost compares with other renewables. The Oyster is also aiming to position itself as an alternative to wind power for utilities. McAdam said that by 2013, his company hopes to be a competitor to offshore wind installations. And by 2015, he hopes to compete with onshore wind. Construction has begun off Oregon’s coast on a commercial U.S. wave energy farm, which is being developed by Ocean Power Technologies and is planned to supply power to about 400 homes, according to national media reports. The system will be installed off the Oregon coast near Reedsport, and it will represent the first phase of an expected 10-PowerBuoy Reedsport wave power station with a generating capacity of about 1.5 MW. The development would be the first commercial-scale wave power farm in the United States. The first buoy will measure 150 feet tall by 40 feet wide, weigh 200 tons and cost $4 million, according to Phil Pellegrino, spokesman for New Jersey-based developer Ocean Power Technologies, Inc. OPT has chosen Oregon Iron Works to construct its first commercial wave energy PowerBuoy system in North America. Nine additional PowerBuoys will be constructed and installed under the second phase of the project. The additional buoys are scheduled to be deployed by 2012 at a total cost of about $60 million. 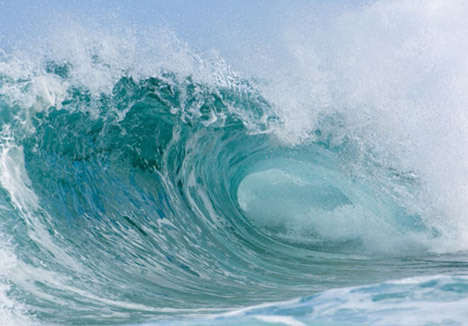 Ocean Power Technologies recently received an A$66.5 million (US$61 million) grant from the Australian government to build a 19-MW wave power project off the coast of Victoria, Australia. Ocean Power Technologies plans to complete its first PB150 wave energy device in the UK for deployment in Scotland in mid 2010.